There should be no new taxes on energy within the EU, and current taxes should not be raised, if prices are to be kept competitive with rivals fuelled by cheap shale gas in the US, the EU's energy chief has told the Guardian. He was speaking as David Cameron's government prepared for a bruising collision with the European commission over renewable energy, in a policy clash that could shape the development of energy infrastructure for decades to come. Günther Oettinger told the Guardian that Europe's industry must become more efficient, and that energy markets must be further liberalised across the bloc, if the EU is not to fall behind US industry. "To compete we must have a functioning internal market for electricity, with more competition [among energy suppliers]," he said. "Energy efficiency is very important – we must consume less. And no new taxes on energy, and no higher taxes on energy, to get to a suitable price for energy consumers [including energy-intensive businesses]." EU manufacturers have been increasingly concerned about the impact of competition from the US, where the massive expansion of shale gas has sent gas prices plummeting to less than a fifth of those seen in the EU and other countries such as Japan. US manufacturers are still only beginning to take advantage of the differential, but this is expected to intensify. 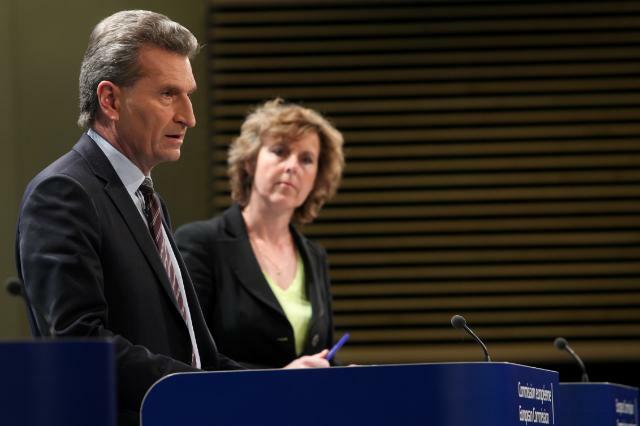 Shale gas could play "an additional role" in the EU, Oettinger said. But experts say it is unlikely to be central. Connie Hedegaard, the commissioner for climate change, also told the Guardian that shale gas would not be the game-changer that it has been in the US. "We should not fool ourselves," she said. "This is not going to be as cheap as in the US. We have different geology that makes it more tricky [to extract shale gas]. We don't have the same wide open spaces. We pay more attention to what local people think." As a result, she said, the EU needed to place far more emphasis on energy efficiency and renewable generation. "The US is becoming self-reliant on energy, but we are going in the opposite direction – from 60% imports to 80% by 2035, on business as usual, according to the International Energy Agency. We need to do more on renewables." The EU's current renewables target, of 20% of energy, is set to expire in 2020, along with the separate target of cutting emissions by 20% by the same date. As part of the push to generate more of Europe's energy at home, the commission says a renewed higher target for 2030 is vital for energy security and economic growth, but the UK wants to scrap the renewables goal in favour of a standalone 2030 goal on cutting greenhouse gases, allowing member states to reach it as they wish. Hedegaard said: "This is important for our renewables industry, which is a stronghold in Europe, creating jobs and economic growth." She said Europe would end up paying "a high price", in climate change and economically, without a further commitment to renewables. Oettinger agreed, saying a 2030 renewables target would be "meaningful" in sending a signal to industry. "I prefer to have a renewables target – if there is no binding target, then member states can reduce renewable energy after 2020, to less than 20pc. That should not be the case. I think we need a realistic new target." George Osborne, Britain's treasury chief, is understood to believe that shale gas, both produced here and imported from the US, as Centrica signed a deal to do this week, could result in lower fossil fuel energy prices in future and hence is hostile to a renewables target. The row is likely soon to become intense, after the EC fired the starting gun on three months of intense lobbying that will help decide 2030 targets for climate change, carbon emissions and energy. Publishing a long-awaited green paper on climate and energy, commissioners on Wednesday set out their aims of forging new targets and policies for Europe that will apply from 2020, when the current set of targets – an emissions cut of 20% and 20% of energy to come from renewable sources – expire. But there is little agreement yet on what form any 2030 targets should take, and by opening a consultation from now until 2 July, the EC is inviting member states, businesses, green campaigners and other groups to make their views known. The results of the consultation will feed into the EC's deliberations, and draft proposals are expected to be drawn up by the end of the year, to be put before the European parliament. The debate is likely to be heated, as these proposals will set out the shape of EU energy and climate policy for decades to come, and are taking place at a crucial time, when many member states are in deep recession, the eurozone is in repeated crises, and there are elections looming in Germany and – next year – for the EU. Current targets prescribe not just emissions cuts for each member state but what each must do to contribute to the separate renewable energy target. But some member states – including the UK – want to scrap the renewables target after 2020, arguing that an emissions target alone is enough. That has dismayed the renewable energy industry, who say that without a firm target the progress made on renewables may be lost. Business groups are also concerned about the price of energy in the EU, with some arguing that it is too high because of green policies, which is allowing overseas rivals to undercut EU companies. Some want to see more progress on international climate negotiations under the United Nations before the EU makes its commitments, but this will be hard to achieve as the UN negotiations are not expected to bear fruit until 2015, when a new global treaty is expected to be signed, to come into force from 2020. Hedegaard urged EU citizens to make their views on climate change action known. "This is about everybody," she said. Energy spokesperson for the Greens in the European Parliament Claude Turmes, of Luxembourg, said: “We need a clear and unequivocal commitment to binding 2030 targets for energy savings and renewable energies. Given the undeniable success of the 2020 renewable energy target, the failure to commit to a 2030 target by the EU would be cutting off its nose to spite its face. “Today’s Green Paper should be the starting point of a robust debate on a strong energy and climate policy package for 2030. This package must be agreed as soon as possible – ideally before summer 2014. For our sector, which mainly invests big and long-term, 2020 is tomorrow. Clarity on the 2030 framework is urgently needed to ensure that electricity companies can invest to put the sector on track for Europe’s transition towards a low-carbon energy system." Eurelectric Secretary-General Hans ten Berge said: "Today's Green Paper should be the starting point of a robust debate on a strong energy and climate policy package for 2030. This package must be agreed as soon as possible - ideally before summer 2014. For our sector, which mainly invests big and long-term, 2020 is tomorrow.Clarity on the 2030 framework is urgently needed to ensure that electricity companies can invest to put the sector on track for Europe's transition towards a low-carbon energy system." Jason Anderson, the head of climate and energy at WWF European Policy Office, said: “The history of EU policy is littered with the corpses of voluntary targets that died of neglect. Post-2020 climate and energy policy that includes binding renewable energy and energy savings targets will be more effective and less expensive than an approach based on greenhouse gas targets alone, supported by the EU ETS. Rhian Kelly, CBI director for business environment policy, said: "It's critical to get political agreement on a 2030 EU emissions target by the end of next year, to encourage the levels of investment that we need in low-carbon technology. Any target must be part of a coherent policy framework that also seeks to minimise carbon leakage, so that all businesses can play their part." Ruth Davis of Greenpeace UK said the British government should play a stronger role. "Ambitious climate and energy policies in Europe are vital for British interests. Strong, long-term goals for cutting carbon and deploying renewable energy are essential to provide a level playing field for British business, and to build new markets for British green goods and services – which provided a third of all growth in our economy in 2011-12. David Cameron now needs to roll up his sleeves, get over to Brussels, and fight for British green jobs." The European Wind Energy Association was also anxious to see new renewables targets as well as an emissions goal. "Member states must now join the European parliament and the Energy and Climate Action commissioners in support of a 2030 renewable energy target, together with a greenhouse gas target. This would allow Europe to replace fossil fuel imports with a thriving European wind energy industry generating large amounts of zero-emissions renewable power and technology exports," said Justin Wilkes, director of policy at the trade body. Fiona Riddoch, managing director of COGEN Europe, said: “The pursuit of an ambitious Energy Efficiency agenda at EU level, and hence inclusion of energy efficiency in the 2030 Green Paper discussion is vital. Europe cannot talk about the energy and climate strategy without talking about the energy efficiency actions which underpin it”. Anders Dahlbeck, a policy advisor for international anti-poverty agency ActionAid said: "ActionAid commends the EC on its ambitions to lower greenhouse gas emissions and for encouraging the growth of the renewable energy sector in Europe. ActionAid hopes that the EC listens to scientists and civil society when consulting on this paper to ensure that unlike some misguided renewable energy policies of the past, it gets it right this time to ensure proper carbon accounting and no negative social impacts on people living in poverty." "We welcome the public consultation and hope it will show that stepping up energy efficiency with a binding energy savings target for 2030 must be at the heart of an integrated climate and energy policy that tackles Europe’s competitiveness challenges”, said Stefan Scheuer, secretary general of the Coalition for Energy Savings. “The European Commission is doing a disservice to the EU’s long-term competitiveness in putting energy efficiency and savings on the back burner and focusing on traditional and short-term supply side options. A greenhouse gas target alone is simply not enough to put the EUon the path to a sustainable energy future”. “This is the kind of long term thinking that is needed from the EU in order to meet its 2050 decarbonisation commitments, while at the same time stabilising consumer prices. A long term commitment to renewable energy leads to lower costs and has been shown by the European Commission to be a 'no-regrets' way forward”, said EREC’s president Rainer Hinrichs-Rahlwes. EURACTIV Czech Republic: Jaké klimaticko-energetické cíle bude mít EU pro rok 2030? 51%. The majority of Sweden’s energy comes from renewable sources. It is an achievement that has surpassed both the EU’s target of 49% by 2020 and the Swedish parliament adopted target of 50 percent in 2020.The seeds to this success can be traced back to the establishment of the official Oil Commission in 2005, which was charged with reducing Sweden’s dependence on oil. A prominent member of that Commission was Volvo’s (former) CEO, Leif Johansson. He announced that Volvo recognised the threat of climate change and the imperative of reducing dependency on fossil fuels. Volvo soon became the first vehicle manufacturer to produce prototype carbon neutral trucks. It made seven in all, each modified for a different type of liquid or gas renewable. Nevertheless transport continues to pose a major challenge to Sweden’s sustainability credentials. Around 90 percent of road vehicles still run on fossil fuels. 2 new Coal-fired power plants just opened in Japan….25% more coal used than last year. Only stupid europeans kill their economy with CO2 taxes and industry destruction. Industrial bases moving back to the USA. Good bye silly EU! Climate Change has “plateaued” according to an editorial in The Economist this week’s (March 30 to April 5). The editorial states “Despite a marked warming over the course of the 20th century, temperatures have not really risen over the past ten years”. EU Commission please take note. In fact Christina, EU isn’t silly. Someone has to lead the revolution, and this time the revolution is for the future. It has been proven and re-proven that we cannot make it in the long turn with the current overall energy system we have been implementing for more than a century. Leaders role is never easy, and EU went onto leading this world into energy transformation for the sake of efficient and sustainable life. Someone must prove the others that renewable scenario is possible and sustainable, while they are acting sceptically and denying any effort based on that. EU may suffer, with decades may suffer while building the new cutting edge model energy system of the future, may suffer financially, may suffer economically, industrially, politically, and even slight drop in the quality of life may be also fact. However, one may never forget, that after the task is complete, only EU will have all those unique cutting edge technologies in possessions accompanied with immense knowledge with exclusive rights upon. Those that will follow than, will have to learn and obey EU if they want to prosper. That is the moment when EU wins! Of course in Sweden they have such a high ratio of renewable energy usage. It is subsidised to the hilt. Now when they provide Scania Buses to Nottingham (in England) fuelled by Ethanol they use all manner of excuses to limit the fuel supplied to the City by saying that they are the only Country that can supply the relevant standard and quality of Biofuel Ethanol for these engines. Having then made that decision they then over-price the Ethanol fuel so that Nottingham is hood-winked in to believing this is so. Now Sweden has not enough Ethanol they import it from Brazil. Then they reassess its standards, to find that it can meet the Scania requirement, charging yet again a phenomenal cost to Nottingham. Phooey, the Burgers of Nottingham should be in contact with a Company and Associate of mine that could supply their buses with Butanol and Ethanol at less than €1-00 per litre. Swedens renewable sector has been developed through policies and actions. It was only an example too say that it is possible to make a change. UK:s policies and actions on Climate Change is not impressive with the latest figures on Carbon emissions – The UK’s carbon dioxide emissions rose by 4.5% from 2011-12, with coal use in power stations jumping by 31% (The Guardian). All government national and local have the opportunities to take decisions they would like to see both in policies and actions. The transport sector – here is the big challenge, but we can already see different options with different types of ethanol and biogas. Markets solutions exist. I do believe that we need smart regulation that will be based on both incentives and barriers based on the principle – polluter pay. Both ethanol and methanol based on cellulose will contribute in the year to come. And don´t forget…. According to the International Energy Agency, the world’s governments spent $409 billion on oil subsidies in 2010. Only $64 billion went on renewable energy subsidies. Smart investment in renewables is good for the economy, good for the climate and good for jobs. If you subsidise Wind Energy to the hilt – applying 60% grants to build, corporation tax reductions for 10 years, and an electricity buy in at €urocents 50 per kWh as an additional reward and embellishment and then pay this to the developers even when they are not producing any electricity then is it hardly surprising that the EWEA is fully optimistic about selling new wind turbines for energy. This is the nonsense which we see all across the European area and Sweden is an equal culprit here. There are far better options in Wind Turbines that are two times as efficient at producing renewable electricity and they are being shut out by this complacency. Sweden like Denmark continually pays over the top for such energy when it is not needed. These Subsidies are diverting the attention away from other more beneficial sources of Renewable Energy such as the Sea Turbines the new generation of spray-applied Photo-Voltaic systems that will reduce these to 20% of the current plate versions. The EU and EU State subsidies and grants are to encourage newer developments and not to continually promoted these systems like those in Sweden.